For patient education materials, see the Hand, Wrist, Elbow, and Shoulder Center, as well as Finger Injuries, Hand Injuries, and Puncture Wound. Photograph taken approximately 12 hours after high-pressure injection injury involving paint. Photograph taken 48 hours after high-pressure injection injury involving paint. Although more than 100 case reports of HPI injuries of the hand can be found in the literature, the incidence is difficult to assess. Nonetheless, a group from the University of Colorado described an estimated incidence of 1 in 600 hand injuries seen in their emergency department. These numbers suggest that HPI injuries to the hand are relatively common, given the widespread use of pressure machinery. HPI injuries often manifest as innocuous lesions on the fingertip of a patient's nondominant hand. Depending on the substance involved, these injuries may follow a benign clinical course (for air and clean water) or may be deceptively destructive and lead to soft-tissue necrosis and amputation (for grease and paint). Rees CE. Penetration of tissue by fuel oil under high pressure from a diesel engine. JAMA. 1937. 109:866-7. Hesse. Die chirurgische und gerichtichmedizinische bedeutung der kunstlich hervogerufenen erkrankungen. Arch Klin Chir. 1925. 136:277-91. Cannon TA. High-pressure Injection Injuries of the Hand. Orthop Clin North Am. 2016 Jul. 47 (3):617-24. [Medline]. Agha FP. High-pressure paint gun injuries of hand: clinical and roentgen aspects. N Y State J Med. 1978 Oct. 78(12):1955-6. [Medline]. Kaufman HD. High pressure injection injuries, the problems, pathogenesis and management. Hand. 1970 Mar. 2(1):63-73. [Medline]. Dickson RA. High pressure injection injuries of the hand. A clinical, chemical and histological study. Hand. 1976 Jun. 8(2):189-93. [Medline]. Craig EV. A new high-pressure injection injury of the hand. J Hand Surg [Am]. 1984 Mar. 9(2):240-2. [Medline]. Sirio CA, Smith JS Jr, Graham WP 3rd. High-pressure injection injuries of the hand. A review. Am Surg. 1989 Dec. 55(12):714-8. [Medline]. Curka PA, Chisholm CD. 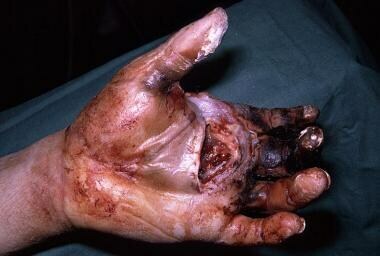 High-pressure water injection injury to the hand. Am J Emerg Med. 1989 Mar. 7(2):165-7. [Medline]. Walker WA, Burns RP, Adams J Sr. High-pressure water injury: case report. J Trauma. 1989 Feb. 29(2):258-60. [Medline]. Ramos H, Posch JL, Lie KK. High-pressure injection injuries of the hand. Plast Reconstr Surg. 1970 Mar. 45(3):221-6. [Medline]. Vasilevski D, Noorbergen M, Depierreux M, LaFontaine M. High-pressure injection injuries to the hand. Am J Emerg Med. 2000 Nov. 18(7):820-4. [Medline]. Harter BT Jr, Harter KC. High-pressure injection injuries. Hand Clin. 1986 Aug. 2(3):547-52. [Medline]. Wheeless CR III. High pressure injection injuries in the hand. Wheeless' Textbook of Orthopaedics. 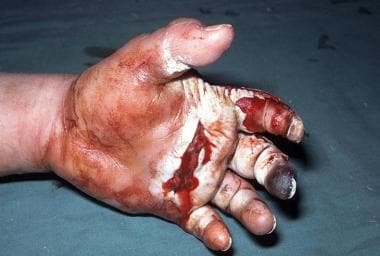 Available at http://www.wheelessonline.com/ortho/high_pressure_injection_injuries_in_the_hand. August 3, 2012; Accessed: May 23, 2017. Bandyopadhyay C, Mitra A, Harrison RJ. Ocular injury with high-pressure paint: a case report. Arch Environ Occup Health. 2009 Summer. 64(2):135-6. [Medline]. Klareskov B, Gebuhr P, Rordam P. Compressed air injuries of the hand. J Hand Surg [Br]. 1986 Oct. 11(3):436-7. [Medline]. Weltmer JB Jr, Pack LL. High-pressure water-gun injection injuries to the extremities. A report of six cases. J Bone Joint Surg Am. 1988 Sep. 70(8):1221-3. [Medline]. Austin JC, Hankin FM. High-pressure water injection causing an isolated tendon laceration: a case report. Am J Orthop. 2007 Apr. 36(4):213-4. [Medline]. Sampson CS. High-pressure water injection injury. Int J Emerg Med. 2008 Jun. 1(2):151-4. [Medline]. [Full Text]. Connolly CM, Munro KJ, Hogg FJ, Munnoch DA. Water-power: high pressure water jets and devastating lower limb injury. J Plast Reconstr Aesthet Surg. 2010 Mar. 63 (3):e327-8. [Medline]. Waibel BH, Schenarts PJ, Sagraves SG. High-pressure water jet injury to the neck and arm. Am Surg. 2009 Jan. 75(1):90-2. [Medline]. Gutowski KA, Chu J, Choi M, Friedman DW. High-pressure hand injection injuries caused by dry cleaning solvents: case reports, review of the literature, and treatment guidelines. Plast Reconstr Surg. 2003 Jan. 111(1):174-7. [Medline]. Loveday I. High-pressure injection injuries. Emerg Nurse. 2007 Nov. 15(7):22-3. [Medline]. Dailiana H, Kotsaki D, Varitimidis S, Moka S, Bakarozi M, Oikonomou K, et al. Injection injuries: seemingly minor injuries with major consequences. Hippokratia. 2008 Jan. 12(1):33-6. [Medline]. [Full Text]. Verhoeven N, Hierner R. High-pressure injection injury of the hand: an often underestimated trauma: case report with study of the literature. Strategies Trauma Limb Reconstr. 2008 Apr. 3(1):27-33. [Medline]. Karlbauer A, Gasperschitz F. High-pressure injection injury: a hand-threatening emergency. J Emerg Med. 1987 Sep-Oct. 5(5):375-9. [Medline]. Kaufman HD, Williams HO. Systemic absorption from high-pressure spray-gun injuries. Br J Surg. 1966 Jan. 53(1):57-8. [Medline]. Christodoulou L, Melikyan EY, Woodbridge S, Burke FD. Functional outcome of high-pressure injection injuries of the hand. J Trauma. 2001 Apr. 50(4):717-20. [Medline]. Foresman-Capuzzi J, Tadduni GT, Callahan T. A 56-year-old man sustains high pressure injection trauma to his hand. J Emerg Nurs. 2006 Aug. 32(4):310-2. [Medline]. Temple CL, Richards RS, Dawson WB. Pneumomediastinum after injection injury to the hand. Ann Plast Surg. 2000 Jul. 45(1):64-6. [Medline]. Hogan CJ, Ruland RT. High-pressure injection injuries to the upper extremity: a review of the literature. J Orthop Trauma. 2006 Jul. 20(7):503-11. [Medline]. Thakore HK. Hand injury with paint-gun. J Hand Surg [Br]. 1985 Feb. 10(1):124-6. [Medline]. Kaufman HD. The anatomy of experimentally produced high-pressure injection injuries of the hand. Br J Surg. 1968 May. 55(5):340-4. [Medline]. Amsdell SL, Hammert WC. High-pressure injection injuries in the hand: current treatment concepts. Plast Reconstr Surg. 2013 Oct. 132 (4):586e-591e. [Medline]. Fialkov JA, Freiberg A. High pressure injection injuries: an overview. J Emerg Med. 1991 Sep-Oct. 9(5):367-71. [Medline]. Stark HH, Ashworth CR, Boyes JH. Paint-gun injuries of the hand. J Bone Joint Surg Am. 1967 Jun. 49(4):637-47. [Medline]. Temiz G, Şirinoğlu H, Güvercin E, Yeşiloğlu N, Bozkurt M, Eser C, et al. A useful option to obtain maximal foreign body removal and better prognosis in high pressure injection injuries: Negative pressure wound therapy with instillation. J Plast Reconstr Aesthet Surg. 2016 Apr. 69 (4):570-2. [Medline]. Marinovic M, Bakota B, Spanjol J, Sosa I, Grzalja N, Gulan G, et al. High pressure injection injury of the foot: a role of negative pressure wound therapy. Injury. 2013 Sep. 44 Suppl 3:S7-10. [Medline]. Lewis RC Jr. High-compression injection injuries to the hand. Emerg Med Clin North Am. 1985 May. 3(2):373-81. [Medline]. Bottoms RW. A case of high pressure hydraulic tool injury to the hand, its treatment aided by dexamethasone and a plea for further trial of this substance. Med J Aust. 1962 Oct 13. 49(2):591-2. [Medline]. Chaput B, Nouaille de Gorce H, Courtade-Saïdi M, Apredoaei C, Rongières M, Chavoin JP, et al. [The role of a systematic second look at 48-72 hours in high-pressure injection injuries to the hand: a retrospective study]. Chir Main. 2012 Oct. 31 (5):250-5. [Medline]. Photograph taken after urgent debridement following high-pressure injection injury involving paint. Debridement of necrotic index and middle digits following treatment of high-pressure injection injury involving paint. Reconstruction of high-pressure injection injury with abdominal flap. Excellent functional recovery after reconstruction of high-pressure injection injury with abdominal flap.